Make sure you know how today's NEC® addresses special conditions, such as standby power systems, fire alarm systems, and fire-resistive cable systems. 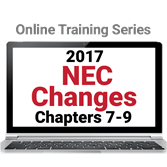 Sign up for online training covering Chapters 7-9 in the 2017 National Electrical Code®. NFPA 70® Changes to the NEC 2017 Edition -- Chapters 7-9 Online Training gives you a vital overview of how and why important requirements for special conditions have changed -- including rules governing emergency and standby power systems, critical operations power systems (COPS), fire alarm systems, and emerging communications technologies. The final training course in the NFPA 70 Changes series provides you with key information about using today's NEC to design and install electrical systems correctly and efficiently using Chapter 7: Special Conditions, Chapter 8: Communication Systems, Chapter 9: Tables, and Informative Annexes. Interactive online lessons tell you what's new, and improve your ability to locate, interpret, and apply today's rules -- so you save time and reduce risks. Keep your NEC know-how up-to-code with convenient online training! Working at your own pace, you'll get an inside look at significant revisions impacting many types of special conditions in all types of occupancies. Understanding these Code changes will help improve your ability to advise clients, design and install essential safety and communications systems, and keep projects and facilities in compliance. Don't miss the final modules in this dynamic series! Complete this four course series and qualify for 0.4 CEUs. Upon successful completion of all four modules, participants will be prompted to download the CEU certificate directly from the course site.